THE automobile industry began to change in the late ’50s. Power and size began to lose their appeal. Sales volume showed that for the first time in more than 50 years the auto industry was no longer a growth industry. The decision was made to swing to compact cars. 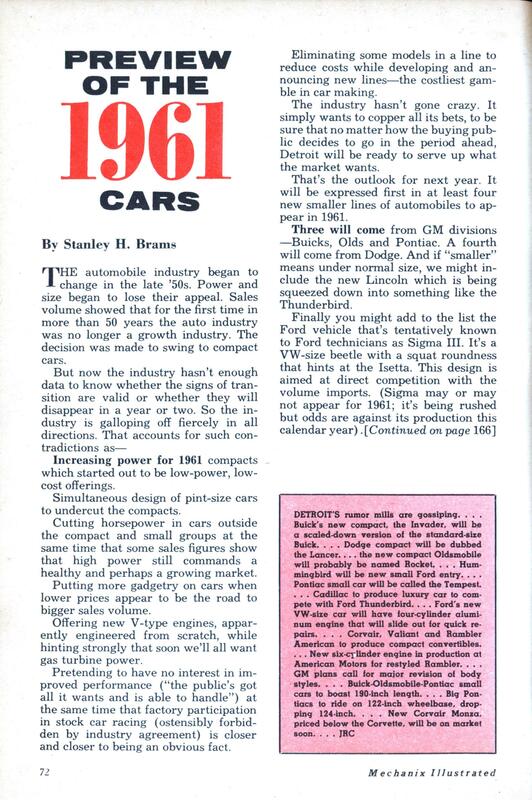 Increasing power for 1961 compacts which started out to be low-power, low-cost offerings. Simultaneous design of pint-size cars to undercut the compacts. Cutting horsepower in cars outside the compact and small groups at the same time that some sales figures show that high power still commands a healthy and perhaps a growing market. Putting more gadgetry on cars when lower prices appear to be the road to bigger sales volume. Offering new V-type engines, apparently engineered from scratch, while hinting strongly that soon we’ll all want gas turbine power. Pretending to have no interest in improved performance (“the public’s got all it wants and is able to handle”) at the same time that factory participation in stock car racing (ostensibly forbidden by industry agreement) is closer and closer to being an obvious fact. Eliminating some models in a line to reduce costs while developing and announcing new lines—the costliest gamble in car making. The industry hasn’t gone crazy. It simply wants to copper all its bets, to be sure that no matter how the buying public decides to go in the period ahead, Detroit will be ready to serve up what the market wants. That’s the outlook for next year. It will be expressed first in at least four new smaller lines of automobiles to appear in 1961. Three will come from GM divisions —Buicks, Olds and Pontiac. A fourth will come from Dodge. And if “smaller” means under normal size, we might include the new Lincoln which is being squeezed down into something like the Thunderbird. Finally you might add to the list the Ford vehicle that’s tentatively known to Ford technicians as Sigma III. It’s a VW-size beetle with a squat roundness that hints at the Isetta. This design is aimed at direct competition with the volume imports. (Sigma may or may not appear for 1961; it’s being rushed but odds are against its production this calendar year). So when Detroit’s first National Automobile Show begins Oct. 15 at the motor city’s new Cobo Hall, there will be a good deal to look at—and a good deal to think about. There will be new engines for the smaller cars—a V8 for the Buick, Olds and Dodge offerings and a four-cylinder unit for Pontiac. (For those who want it Pontiac will have a beefier, costlier engine as well.) If the Ford prototype makes the show there will be yet another new engine. The transaxle concept which made its debut on the 1960 Corvair is reported ready to go into other GM lines. There is talk of a central hydraulic system nearly ready for Ford offerings. Chrysler’s alternator principle of generating electricity, which replaced conventional generators on 1960 models, is on the threshold of expansion. I’ll get back to new mechanical developments later; first let’s take up what everyone’s thinking about. The big interest, of course, will be in the new compacts. Except for Sigma they will be built on wheelbases of 112 to 115 inches with overall length corresponding to that of Ford’s Comet. In appearance they will be relatively plain. Interiors will be showier, however, for these are designed as companion cars for middle-price lines. The BOP body will have a fatter back than that of Corvair but otherwise it will be a recognizably GM product. The Dodge offering will have a family resemblance to its big brother line but with fender and slanted window touches borrowed from Valiant. Engines in every case will be in front, so there will be a fair degree of orthodoxy. And this brings up a prize riddle of the moment: What goes on inside the GM family? Chevrolet Corvair ads trumpet that the logical place for a compact car engine is in the rear while Pontiac, with nearly the same power and size, will be placing its engine forward. So far as the standard lines are concerned, the biggest change for 1960 will be the virtual abandonment of fins by the finniest company—Chrysler. Sweeping fender lines will be seen on the 1961 Plymouth rather than the upraised extensions of the past; there will be a complete re- vamping of that line’s body shell in the wake of its not-fully-successful 1960 selling season. The smoothing and new treatment of the Plymouth will be echoed in variations on the other Chrysler Corp. cars; the fin treatments on those other cars will be reduced to a bare minimum. And the daddy of big fins, Cadillac, is going to de-fin if reports are true. What some stylists call “blades” will tend to replace fins all through the industry, blade treatment being what you saw this past year on Ford and Chevrolet. The Chrysler wedge shape will continue but less exaggeratedly. GM bodies will provide more headroom. Ford’s bodies will be more square at the corners than heretofore; their blades will slant upward a little more than was the case in 1960. Ford will introduce a kind of grille treatment at the rear, embellished with bull’s-eye taillights like those of past years. American Motors will have a bigger-looking Rambler with slightly longer wheelbase—but not so much bigger that the company will be accused of abandoning the compact car concept it pioneered. As for Studebaker, the changes will be a new grille and new trim modifications. There will be considerable emphasis on front-end restyling. General Motors cars are moving toward unitized construction and one step on that road is the use of integral construction behind the cowl with stub frame extensions forward. Front fenders are to be bolted on and this creates an easy opening for redesign. The 1961 Chrysler line will embody the reasoning that the public gets its impressions from the front end—so concentration is on the new grille and the fender design. Decks will be lowered all around. In some GM lines, notably Chevrolet’s, the rear deck will be dropped down as on the current Cadillacs or the even lower El Dorados. Hoodlines, too, will be lowered wherever possible. There will be some interesting new rear quarter-panel treatments. Panels will be rolled around the corner, creating a line a little like that of the sedans of two decades ago. Glass once more will encroach a little farther into roofs; the “glass house” gets nearer by the year. Chevrolet’s experimental Corvette portends a long-term pattern for roof styling, including two bubbles designed to eliminate glare and at the same time permit adequate headroom and maximum visibility. Speaking of that experimental Corvette, you might watch to see how soon its audacious rear-vision mirror, mounted on the roof, creeps into production cars. It could happen in 1961. Aluminum will be employed more around the body. The major new use is expected to be in bumpers; there have been extensive testing programs with chrome-plated sections. The big weight reduction is in the overhang sections of the car, so riding characteristics should be greatly improved. There will be a welcome note for owners who must drive their cars more than a year or two, particularly in areas where salt is used on the streets in the winter. Rocker panels on various models will henceforth be made of galvanized material, far more rust-resistant. Zinc will also be used on some of the GM grilles, after several years of using other metals there. Aluminum will be used for dashboards on the BOP smaller models. The Studebaker Lark, on the other hand, will go from metal to a more handsome molded plastic. In the new smaller cars we’ll see aluminum powerplants for Buick, Olds and Dodge offerings; relatively tiny V8s in the 140-150-hp range. Rambler, too, is getting an aluminum engine ready for market, using a diecast block with cast steel liners, and another new engine for the restyled Metropolitan. There will be some improvements in the Comet powerplant to give it more torque and probably more output, compensating for the added weight of this offering over that of Falcon whose engine was used in the 1960 Comet. Corvair, too, will employ a somewhat more powerful engine. Carburetion on the latter car, incidentally, is being considerably revamped and other changes are also being made so gasoline mileage will be more dependable. The Ford Sigma is being planned around a completely unorthodox powerplant in V4 size. And on the score of unorthodoxy you might also note that the aluminum engine for the smaller Buick and Olds models will have a novel kind of intake manifold engineering employing a circular path—presumably with the idea of reducing space requirements. Pontiac’s in-line four, cast-iron, will be basically half of the Pontiac V8, probably mounted at an angle to make a lower hood-line possible. Horsepower will be about 100, making it (together with the size of this particular car) a true compact of the Rambler-Lark class. Transmissions have been slimmed down all across the industry so as to reduce floor humps. A step beyond that, of course, is transaxles. A novel touch in that direction is being worked out for Thunderbird, although it almost surely won’t be ready in time for 1961: the transaxle will be mounted atop a front end drive system, doing away with the transmission tunnel entirely. All sorts of other innovations are in preparatory stages but, again, it’s a question whether they’ll be ready in time for the 1961’s. One such is a central hydraulic system at Ford. Many car accessories, perhaps all, would operate from a single power source rather than individual units. The development of a low-cost accumulator for these power requirements has finally been worked out. From here to production of a central system is only a matter of time and bug-cleaning. Cars without pedals are being studied. Actually this is a misnomer; there are pedals but their travel has been cut down to such a minimum that they appear to be no more than humps on the floor. Cars headed for California will be equipped for 1961 with anti-smog devices. There are any number of these in varying stages of development and testing. Finally, appearing in growing numbers in 1961 will be electric cars, the first in about 40 years. Most are currently being tested in commercial fleet operation. In Britain, electric vans (not cars) were used for deliveries where economy was important but speed wasn’t, most famously for milk floats, though the London department store Harrod’s also had a fleet of electric vans making deliveries round the city. As for misguided predictions, the one about gas-turbines being the Next Big Thing is equally bad. Various attempts at building gas-turbine road cars were pretty unsuccessful. Even for racing they never superseded piston engines. That ford looks much like the chrysler gas turbine of a few years later. The main problem with gas turbines was poor fuel economy; the wankel engine also had fuel economy issues. I’m still waiting for my flying car. Weren’t we supposed to have those in the 21st century, along with jet packs for personal use. Nothing gets old faster than the future. With today’s technology, would gas turbine/electrics be practical? Too bad an electric car can’t TOW a running generator for long trips! Ya, Know I am getting pretty tired of the whole “Where’s my flying car?” shtick. Outside of the Jetson’s who predicted everyone having a flying car. Anyone with the money and time and can pass the physical can get a pilots license. So if’n you want to fly you can do that. Union Pacific Railroad had Gas Turbine Electrics, but they were locomotives. Besides that, “promised” aerocars included autogyros and helicopters that could take off from anyone’s back yard or apartment rooftop and land on the office’s. (I wonder what it would cost to park one for the day on the roof. Cars are $35 a day at my office, and that’s with 4-5 levels of parking garage.) And ducted fan “jeeps” that even the USMC looked into, as I recall. Of course, frankly many of us never really took them seriously. Air traffic control would have been totally overwhelmed, and thousands of yahoos who can barely control a vehicle in two dimensions would be unleashed in three, with “collateral damage” under every air-to-air crash. Actually Toronto there are some 100 air parks in the US as well as air parks in Canada, Europe, and Central America. 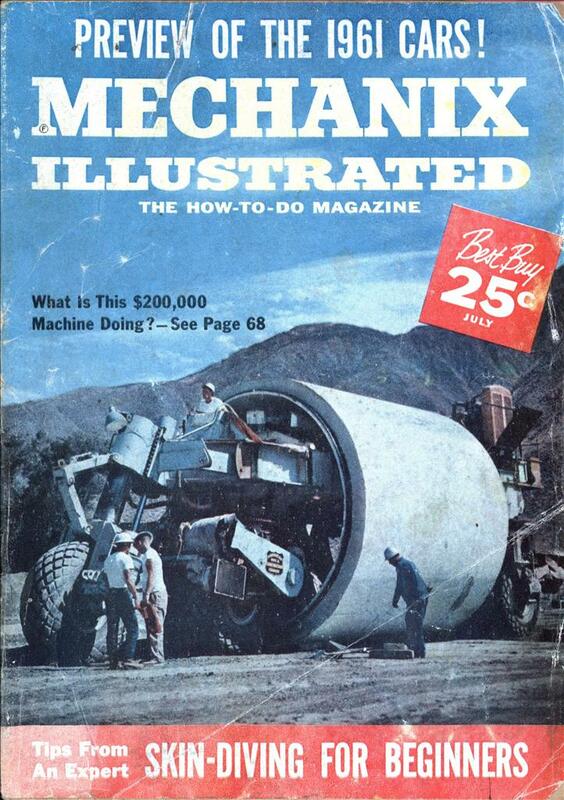 The trouble with the ducted fan vehicles and the flying platforms of the 60s were they just weren’t economical.